The first egg laid by a rare ibis, gifted to Japan by China last year, is seen Saturday at the Sado Japanese Crested Ibis Conservation Center in Sado, Niigata Prefecture. NIIGATA - A rare ibis gifted to Japan by China as a symbol of friendship last year has laid an egg for the first time, Niigata Prefectural Government said Sunday. 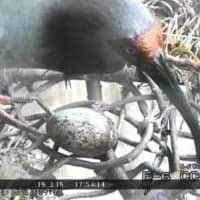 The egg laid by Guan Guan, one of a pair gifted in October 2018, at the Sado Japanese Crested Ibis Conservation Center is expected to hatch in mid-April if all goes smoothly. The female ibis arrived at the facility in Niigata Prefecture with the male Lou Lou on the occasion of the 40th anniversary of the two countries’ peace and friendship treaty. The offering by China of the internationally protected species to Japan was the first since 2007 after years of soured ties between the two countries over territorial and wartime issues. 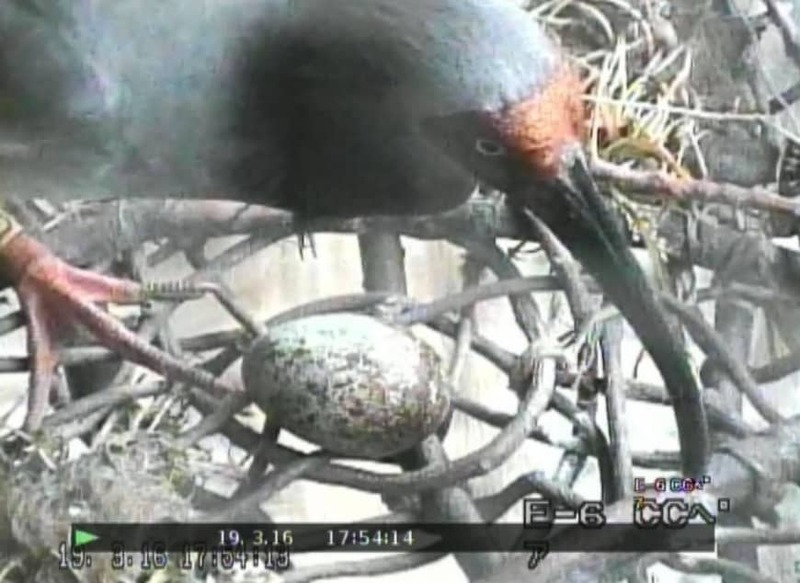 A worker at the conservation center noticed the egg on Saturday via a video monitor, and later confirmed that it had been laid before 5 p.m. the same day, according to the facility. The conservation center is planning to artificially incubate it to maximize the chick’s chances. Guan Guan and her three-year-old mate had been exhibiting the mating ritual of exchanging small branches since mid-February, according to the center. Japan-born ibises became extinct in 2003. Since then, Japan has been artificially breeding ibises by relying on Chinese donations, the first of which was in 1999, and preparing them for reintroduction into the wild. Those that have been released into the wild in the city of Sado are all descendants of five of the birds received earlier from China. The center believes that with the addition of Lou Lou and Guan Guan, the genetic diversity of its artificially bred ibises will increase.